Summer is hurrying to a close. I saw geese migrating a few days ago and when we were running last night, we passed a huge flock of birds gathered on the phone wires; the equivalent of people flooding an airline terminal as they prepare to fly to Florida for the winter. Good thing I made a lot of jam two years ago! Next, the poem I wrote about reader’s reactions to SPEAK was featured on the website for Grrl Power! Girls Studies at UCF. 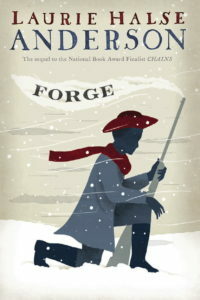 And last, BUT NOT LEAST AT ALL, FORGE made the Autumn 2010 Children’s Indie Next List! Set… dig a hole in the ground and bury your doubts. Cover them with salt and then spit on them. Now that you have put your doubts where they belong, you can write. That, my friends, is an awesome line. (Even though it frustrates the hell out of me.) And it sparked today’s prompt. Which rules (big or small) does your character break when no one is watching her? Which rules would she break if she knew she would never be caught? OR which rules would YOU break if there were no consequence? Write a scene in which your character breaks those rules. Extra points – write another scene in which she gets caught anyway. How will she react? What is so important to her, she is willing to risk something for it? In one of my WIPs (young adult), my character steals, and so I had him getting caught for this prompt, curious to see how he would react. I have always imagined that he would follow the instructions of the officer who catches him. Uncomfortable as it would be. Today, I let him react the way he wanted to, and he surprised me. I had been trying to manipulate him into obeying authority, but clearly, that is not who he is. At least, that is what I learned today in my thirty minutes following the prompt. Thank you, Laurie, for pushing me to let go. I loved hearing you read your poem, Laurie. It speaks volumes. What a wonderful blessing to have crafted your art in writing to the point that it touches the heart of a reader and powerfully changes them along the way. Thank you for sharing your heart today. I can only imagine what people are thinking when they choose to rob, lie or cheat another. I love how you reframed your frustration into a writing prompt! Way to go girl! Sending you a cyber-pat on the back and a big round of applause. Today was the best day of writing. Period. The prompt jumped at me faster than a spidermonkey. It grabbed my hair and forced the pencil to create words I never thought were possible with such a simple, yet complex, promt. Thank you truly Laurie. I felt so inspired today. Ach. I had to be at school today figuring out the library class schedule. Heading to write now. The prompt is perfect for where I am in my WIP. So uh, I haven’t had anything particularly contributive to add to the blog, just soaking it up and writing with intention every day. As my “real” job becomes more real (school is starting soon!) my brain is getting crowded with the “musts” and “shoulds” and it’s cramping my creativity. I’m still running (and there is beginning to be less of me already) and still writing. I’m the bulldog after the “fear” piece that I nearly buried out in the yard. Just a bit more work and then I plan to love it. It’s one for posterity–cause they’ll probably be the only ones still speaking to me after this leaves my hands. If you feel a tremor in the ground, that’s just this thing that I have written, making it’s mark. I’m the girl who wrote the review about Frío, the spanish version of Wintergirls. I had no idea that the review had been published here and I’m so excited to see it. I’m happy because you loved the review… I really loved the book and, as I said in the review, it has been the best book than I’ve read in lots of months. Thanks so much – obviously I loved the review. You did a fantastic job with it.